Collin is a member of the firm’s Health Care Litigation group. He has spent almost 20 years representing hospitals, health care systems, physician groups, and other providers, in a wide range of litigation matters. 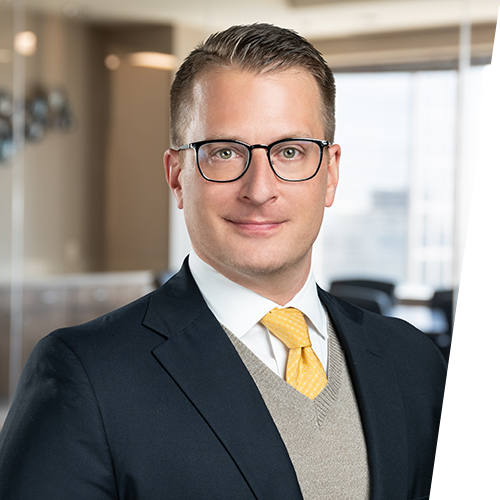 Collin has tried cases to juries and judges in the state and federal courts of Missouri and Kansas, and spent much of his career with an Am Law 100 law firm in Kansas City. He has been recognized by his peers as Best of the Bar in his field and frequently speaks to physicians, nurses, dentists, administrators, and members of the bar on topics ranging from best practices to malpractice law. Achieved successful trial verdict in case where the patient died from infective endocarditis. Achieved court judgment and successfully argued on appeal a case with fraud and malpractice claims against a hospital. Achieved multiple dismissals of malpractice cases against hospitals, physicians, and health care providers. Successfully litigated and resolved claims invoking the Fraud Claims Act and civil litigation involving patients suffering from acute ischemic stroke, fetal morbidity and mortality, locked-in syndrome, myocardial infarction, spinal cord infarction, herpetic encephalitis, anoxic-ischemic encephalopathy, subdural hematoma, fractures, pulmonary emboli, and a myriad of other issues. Annually tried cases on a pro bono basis for impoverished clients with probate and guardianship needs.